Did You Know? A Good Start to Your Child’s Day Begins with Breakfast! Have you heard of the ancient proverb that says “Breakfast like a king, lunch like a prince, dinner like a pauper?” Ensuring a proper and wholesome meal first thing in the morning is indeed a good habit to develop from a young age. According to a Taylor Nelson Sofres (TNS) study in 2011 that surveyed mothers aged 25 to 45 years with kids 6 to 16 years old, 92% of mothers agree that a good start to their child’s day starts with breakfast. These mums recognise that breakfast is important to provide their kids with the key nutrients they need to stay involved in their activities. Due to our hectic, urban lifestyles, some parents may exchange breakfast time for a few more precious minutes of shut-eye for their kids before their early morning school session. Children too may sometimes prefer scooting off for play or sports activities, instead of sitting down for a morning meal. For some mothers, preparing breakfast can be a challenge, or even, a chore. 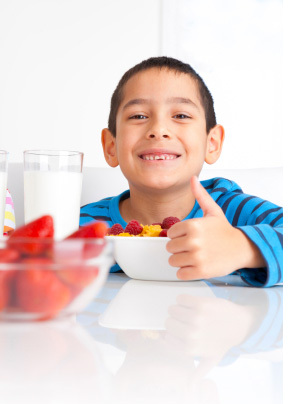 However, it is precisely because kids need energy for school and play that breakfast should be regarded as the most important meal of the day. Think of “breakfast” literally as a time of “breaking fast”. This is when the body gets to refuel after an average of eight to ten hours of sleep, providing an energy boost to jumpstart the day. Moreover, just like choosing the right grade of fuel to power your car’s engine, the quality of your child’s breakfast matters too. Can’t find the ideal breakfast solution, you say? Or simply can’t please slow and picky little eaters? Since mornings are a busy time for the family, cereals are always a popular breakfast choice for both parents and kids because they are fuss-free and tasty. When taking your pick along the supermarket aisle, always look for cereal options that contain whole grains such as NESTLÉ KOKO KRUNCH or NESTLÉ HONEY STARS. Made with whole grain, NESTLÉ Breakfast Cereals not only has fibre, B vitamins and iron to start your child’s morning right for a great day in school, it is also a quick and convenient choice for mothers who don’t have time to fire up the stove to prepare the morning meal. To pump up the nutrition goodness in your bowl of cereal, add milk or yoghurt, or top up with fresh or dried fruits such as strawberries and apples, and even healthy nuts like pecans and walnuts. Worry about what your kid snacks on during school recess or later in the day? A whole grain breakfast ensures that he gets a third of the recommended daily dose of nutrients and a good head start for another activity-packed day! What’s The Deal About E-cigarettes? Parents, Read This. Quiz: Parents, How Much Do You Know About Antibiotics?